Stephen King, left, owner of Zone Radio in Bangor, answers questions during a press conference regarding programming on WZON 103.1 FM and 620 AM at the radio station's headquarters in Bangor. Also participating in the press conference were radio personalities Pat LaMarche, second from left, and Don Cookson, third from left. 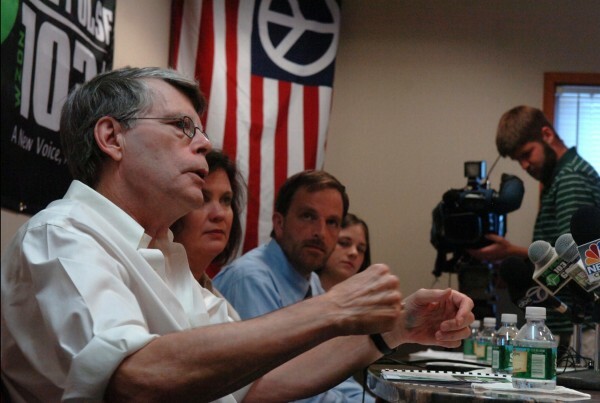 BANGOR, Maine — Horror novelist and Bangor radio station owner Stephen King announced on Tuesday a new talk radio show featuring a former vice presidential candidate and a former Maine secretary of state’s communications director. “We wanted to shake things up a little bit in the market,” King said. King, the owner of Zone Radio Corp, said WZON 103.1 FM and 620 AM will launch “The Pulse Morning Show” on Sept. 12. The show will air 6-10 a.m. on weekdays and online at www.zoneradio.com. The station also is expanding its news department. King said he was thrilled his station could grow at a time when others have had to cut staff and decrease the amount of programming and production. Former journalist, Bangor Daily News columnist and gubernatorial candidate Pat LaMarche will be joined on the show by Don Cookson, a former reporter and communications director under Secretary of State Matt Dunlap. LaMarche, who was the vice presidential candidate in 2004 under Ralph Nader for the Green Party, said the show would target politicians and public officials in Augusta and Washington, D.C., who push around Maine residents, especially those struggling with the welfare system. “We’re going to try to be informative. We’re gonna be provocative. We’re going to be amusing, and we’re going to try to be a positive community force,” King said. LaMarche and Cookson said humor would play a big part in their program. ”We want you to laugh all the time because if you don’t, you’ll cry,” LaMarche said. The morning show hosts have pledged their support to community and regional service causes. On the first day of the show, the station will begin collecting gas and grocery gift cards for the Wounded Warrior Project to help veterans, servicemen and servicewomen and their families. “Unfortunately, we’re in a situation and we’re in a time when there are a lot of people in need of that help,” Cookson said. “It is staggering to think that people can go and be willing to pay the ultimate price and come home unable to feed themselves or get the fuel to get to their doctor,” LaMarche said. The first show, which airs the day after the 10th anniversary of the terrorist attacks of Sept. 11, 2001, likely will focus around how that day affected Mainers, according to LaMarche. WZON will continue to cover sports, including Bruins, Red Sox and Celtics games. “The Pulse Morning Show” will ruffle feathers and worry state leaders and officials, the hosts and their boss said.